What is the best dog crate water bottle? Do I need a dog water bottle stand? Whether you are going on a trip abroad or just to your local vet, owning one of the best dog water bottles will come in handy. Dog shows and handlers are also loving them. Dog water bottles are very straightforward to use and do not involve any complicated manufacturing process. Therefore, they generally last you for plenty of years. Just make sure you keep them clean! 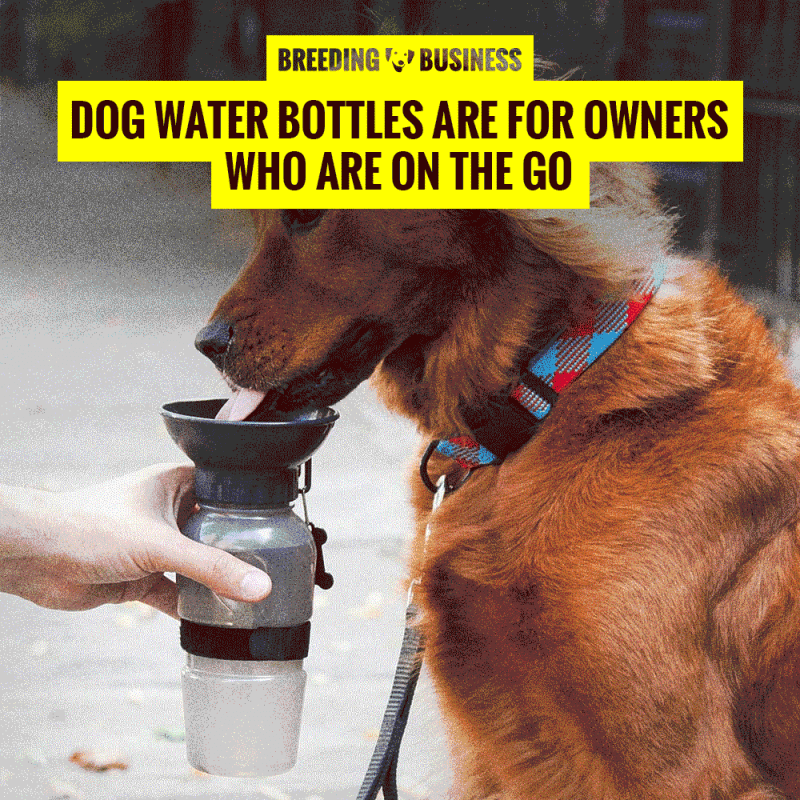 The only function a pet water bottle is meant to perform is to provide drinkable water to the dog while on the go. When deciding on which water bottle for dogs to get, you will normally encounter three types of products. the cheap plastic water bottle ($10) — it does the job, but you will probably have to replace it every year. the sturdier PVC model ($15) — which lasts for a very long time and is very practical. the fancy pet water bottle ($20+) — generally with a beautiful design and ingenious features. 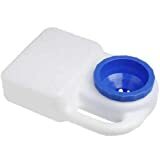 Obviously, dog water bottles should all have a water bowl attached or screwed to them so your dog can directly drink the fresh water off the bottle. However, the whole design will change depending on the water bottle’s use case. Remember, there are dog water bottles for crates, for kennels, for cars, for walking, for camping, for puppies, etc. Not all pet water bottles are created equals! The cheapest products may have a few leaks reported by customer feedbacks, while more premium products tend to be better put together. A leak means a big mess so it’s not recommended to buy the least expensive product you will find in our situation. Plus, price differences are very small so it’s worth spending the extra ten-dollar note. Depending on how often you will use yours, it may make sense to spend the extra $10 or $15 to buy a creme de la creme dog water bottle rather than the $6 alternative. Some pet water bottles are priced very low, even below $10, but they are small. Perhaps too small for normal use. Be careful since most pictures on ecommerce websites aren’t really showing much of a scale so you may be deceived thinking it is a one-litre dog water bottle when, in reality, it only contains 250ml. Dog owners who enjoy dog shows, camping or short trips, all love their dog water bottle! There is no best system here, it simply depends where and when the bottle will be used. The size of your dog also matters: crate water bottles have a metal sipper tube that doesn’t suit large dogs who need to drink a lot, often. 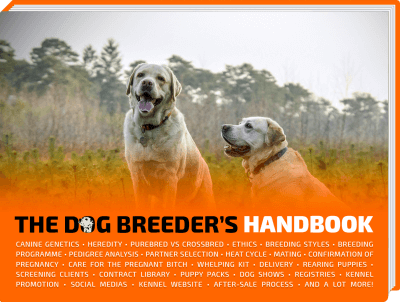 Now that we know what features do matter, we’ve studied all the water bottles available today for dogs and handpicked the ones that offer all that a dog owner would expect, and more. We know some of our readers prefer low-priced items while others only get the top products, so we put the best of both worlds! 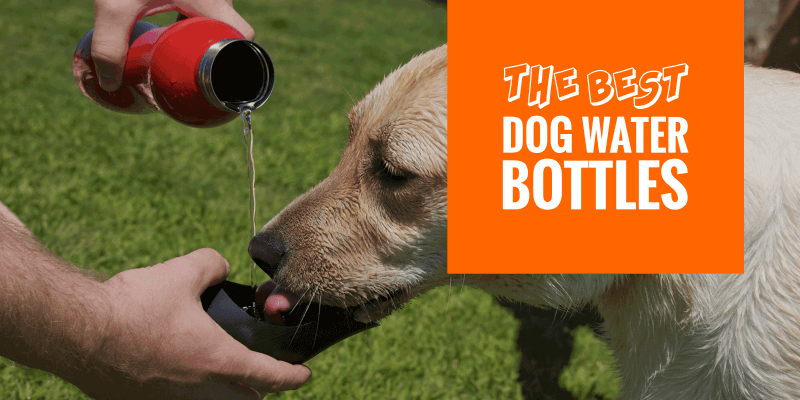 Here is our shortlisted top 7 best dog water bottles money can get you today. Arguably the best handheld dog water bottle you can find with a beautiful stainless steel design. Both parts are BPA-free and you can even drink from it if you want. 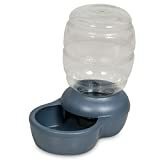 The top travel lid is ergonomically curved so your dog can effortlessly drink from it. Although the design is incredibly eye-catching, there are no complex pieces or special mechanisms involved, it’s a simple twist lid that screws itself onto the bottle. Nothing can break or leak. The volume is of 25-ounce (or 740ml) which is very reasonable and should be more than enough for short trips. If you are traveling by car, simply load a couple of regular bottles of water to refill the H2O4K9 when it’s empty. It also comes in six colors: pure stainless steel, jet black, denim blue, racecar red, baby pink, and treefrog green. Thanks to its easy-to-clean materials, both the top lid and the main bottle can be rinsed or disinfected within seconds using dishwashing soap for example. Far from being a fancy or premium water bottle for dogs, the Gulpy Water Dispenser is a very cheaply-priced product just managing to do the job just fine. Don’t get me wrong, this dog water bottle with bowl attached does feel flimsy and probably won’t last you more than a year, but it’s alright at this price. More worrying about this dog travel water bottle, though, is that there is no mention that it is BPA-free so I assume it is not. Volume is 20 oz (or 590ml) so it’s not a lot, but more than enough for a few drinking sessions. Do I recommend it? Yes, but only for those very short round trips to the vet or to the local pet store where you might not even need to use it. I haven’t witness or read about many leaks which is always a plus for a cheap product. 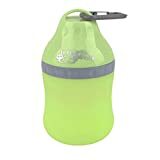 The Lixit Waterboy is the perfect example of a self-standing dog water bottle with integrated water bowl. It is BPA-free and has been designed to be used to dogs of all shapes and sizes: from small lazy dogs all the way to large active dogs. The shape has been engineered to be a dog water bottle that is spill-free, making it a lifesaving device in a crate or with very active pets. So far, this is the best hybrid of a travel water bowl and a dog water bottle, but there is one issue… It does hold a lot of water which makes it rather travel-unfriendly. If you are on the go in a car, this is a dream product and buy it now. If you are just with a backpack or going on a walk, it is a little too big to be a realistic and convenient option. If you are looking for a dog travel bowl or bottle for crate, the Lixit Travel Water Bowl is perfect. Another pet water bottle with bowl attached, it holds 14 ounces of water which means a little less than half a litre. The Highwave AutoDogMug is also BPA-free and designed to be leak tight. It fits on most cup holders which makes it easy to bring when on the go. Forget about gravity, using this water bottle is a matter of squeezing! To fill the water bowl, just give it a good squeeze and hold it while your dog is drinking. If your dog is done, release the squeeze to allow the water back into the bottle. Make sure to change the water regularly to avoid any bacteria to spread and grow inside the bottle. Available in three basic colors (blue, pink or smoke), the manufacturers insists that there might be a few drops leaked so take that into consideration before buying this product! More of a water dispenser than a dog travel water bottle, the Petmate Replendish Gravity Waterer comes in five different sizes (0.5, 1, 2.5 or 4 gallons) and five discreet colors. The volume held (even with the smallest size) is rather big so you would only want to buy this product to use it at home or in a temporary location such as your camping spot. For those who really mind cheap China imports, this product is made in the USA! To block bacteria, bad odors and parasites, this travel water dispenser for dogs is boasting the Microban® Antimicrobial Protection technology. That makes it a great product when you cannot clean it up daily. With over 5,000 positive reviews online, the Petmate Gravity Waterer is a people pleaser with a proven track record. It suits toy breeds as well as giant dogs, and thanks to its big bottle, it become so heavy that it should not be flipped anytime soon. A lovely can-sized dog travel bottle that is perfect for small dogs during short walk, journeys and trips. It is certainly lightweight and compact but also durable, safe, and leak-free. On the flipside, you won’t have water for long so it is almost useful for longer journeys unless you have a sure way to refill the water often. Not dishwasher friendly, you need to rinse it by hand with soap regularly. The silicone used tends to prevent quick growth and spread of bacteria and fungi so no need to panic and clean it hourly. The smell of the plastic is quite strong after you first unpack and unwrap it — wash it several times to get rid of the smell and residues! To sum it up, the Pyrus Collapsing Travel Bottle is ideal for walks or short journeys but too small for anything longer! Well-rated and popular dog crate water bottle for small breeds and puppies, this product hold 16 oz of water (i.e. 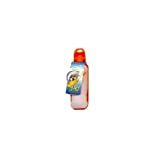 470ml) and is ideal for small pets. It attaches easily to crates and travel carriers thanks to hooks that straightforwardly sit on the cage’s horizontal bars. Built to ensure no leakage, this crate water dispenser is lightweight and uses non-smelling materials. The bottle, frame and hooks are made of high-quality plastic materials while the drinking tube is made of drip-proof stainless steel. All materials used are engineered and designed to avoid leaks even when the bottle is full for a very long time. Cleaning is easy AND required! Unhook the water bottle from the kennel or crate, disassemble all the parts (top lid, tube, bottle) and rinse them with soap separately. Leave them to air-dry or use a clean towel to do it immediately. Keep the stainless steel ball and valve and clean and free of any debris. Hair, sand, excess dust in the tube would cause dripping over time. Before I let you go, I wanted to answer a few questions we received about portable dog travel water bottles. This type of products is not rocket science so make sure you first understand what you want to use the travel bottle for, to then purchase the right product base on your needs. Again, do not go for a super cheap (i.e. 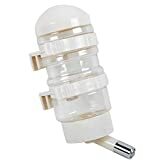 less than $10) or you are heading towards leaks and breaks head first! The most suitable dog water bottle for crate really depends on the size of your dog and how large the crate is. If you own a large dog, you need a water bottle that will resist the movement of a dog and generally this will lead you to buy a standing water dispenser such as the Lixit Waterboy Travel Water Bowl. If you own a smaller dog or a toy breed, you may easily get by with a drip-free hanging water bottle with a drinking valve. Regardless of the product type, make sure it can withstand a little agitation and cannot spill easily! Imagine your pour pup laying down in a crate full of water. A stand for a dog water bottle rarely stands up for long: dogs can easily knock them over. Prefer a bottle that is hooked to the crate, or a bowl that directly sits on the floor. Only useful for suspended and hanging dog water bottles, stands are not recommended for dogs. Indeed, puppies and adult dogs move a lot and they would knock the stand with a handful of minutes. Instead, you should either use a floor water dispenser or a hooked crate water bottle; both will resist agitated dogs and should not spill easily. So the general consensus is to avoid stands and prefer regular floor dog bowls or crate water bottles. 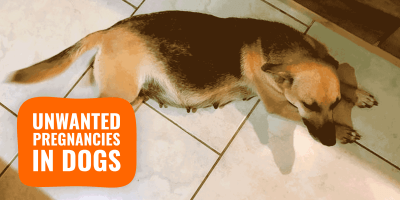 Although it is very tempting to put dog water bottles in the dishwasher, I want to warn you that most of these products are not dishwasher-safe. Therefore, take five minutes to delicately disassemble all the bottle’s parts and wash them individually with care. Do not use burning hot water as it may loosen the materials, which would often result in leaks and dripping. Use regular dish soap. 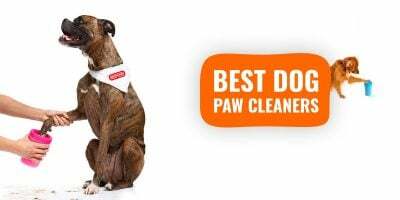 Clean the bottle every day you use it, after your dog has used it. 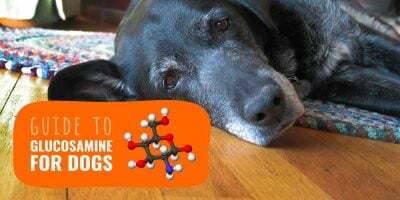 Avoid using strong disinfectants or dangerous stronger chemical or you must use a heavy rinse to make sure you get rid of any potentially toxic compounds before using the dog water bottle again.